My next step in building the panels is edge banding. To straighten the veneer edges and to expose areas to which my edge banding is glued, I turn to one of my router jig workhorses. 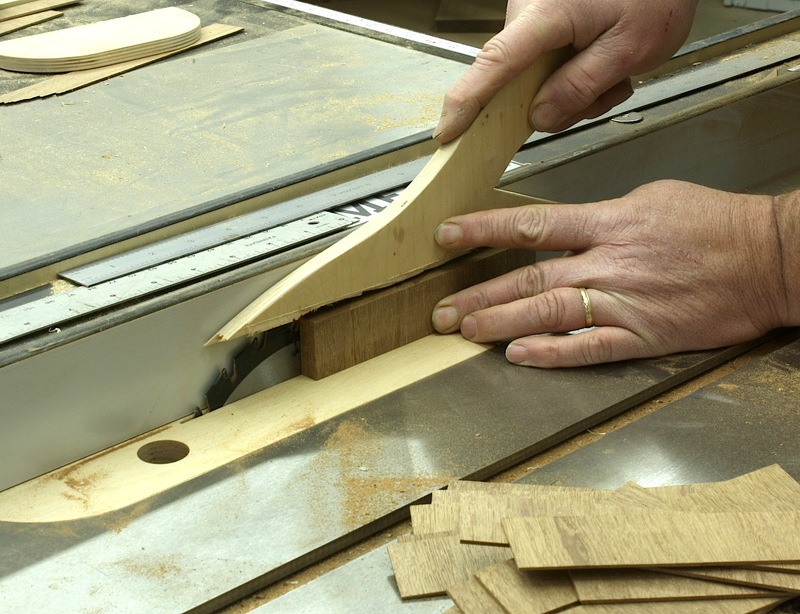 There is nothing easier to use than a simple straightedge jig and a pattern router bit to get a dead-straight edge; Yes, the edge is only as straight as your jig. My jig is a 6″-wide piece of plywood with a 4″-wide piece applied on top – this particular rendition has pine on the top, but any wood or plywood works. After I build the jig, it gets a pass over my jointer to achieve that straight edge. From there I’m ready to work. 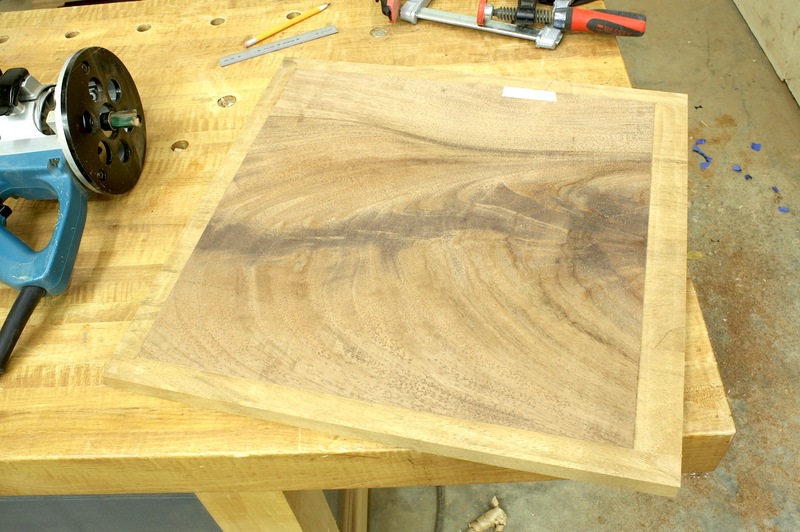 I marked my panel at 7/8″ from the edge, positioned the jig at the marks then clamped it in place. 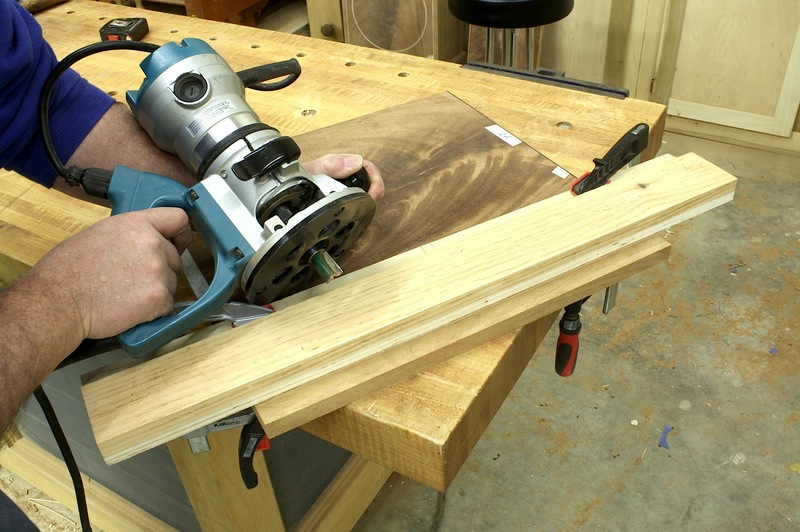 The extra 2″ of width allows easy clamping and any clamps are out of the way of my router base. I set my depth of cut to 1/16″, then routed the edge. After working all four edges – the bottom edge being 1-1/4″ to allow a matching 7/8″ after a moulding is attached – I was ready for banding. Shop-made edge banding is way easier to work than commercially available paper-thin veneers, it’s easy to make and it is from scrap. These are all pluses when woodworking. After cross-cutting 6″-wide pieces to 1″ in length, I set up my table saw to rip 1/16″-thin strips. Make sure you do this using a zero-clearance table saw insert and a push stick of some kind. I also like a super thin blade for this, so I bought a 7-1/4″ saw blade that is dedicated to light work at my saw. Enough pieces were cut to wrap the door and base panel, along with a few extra. Edge banding is wrapped around the field, but I also needed a few pieces for the top edge of the door that were longer due to the curved edge. I only need a few pieces, so I repeated the same steps with another piece of scrap. Those top-edge pieces require a bit of shaping to meet the profile. That meant many trips between the door and my sanders, spindle and disc. 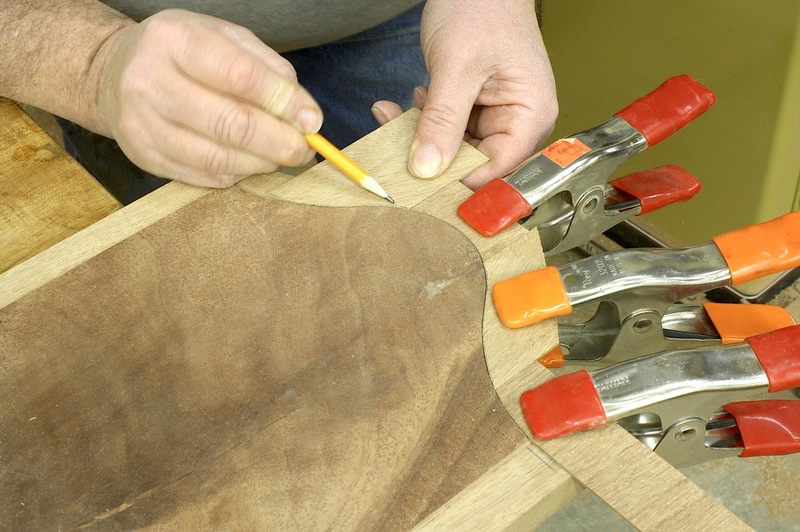 Spring clamps are great at holding profiled pieces as you fit additional pieces along the edge. 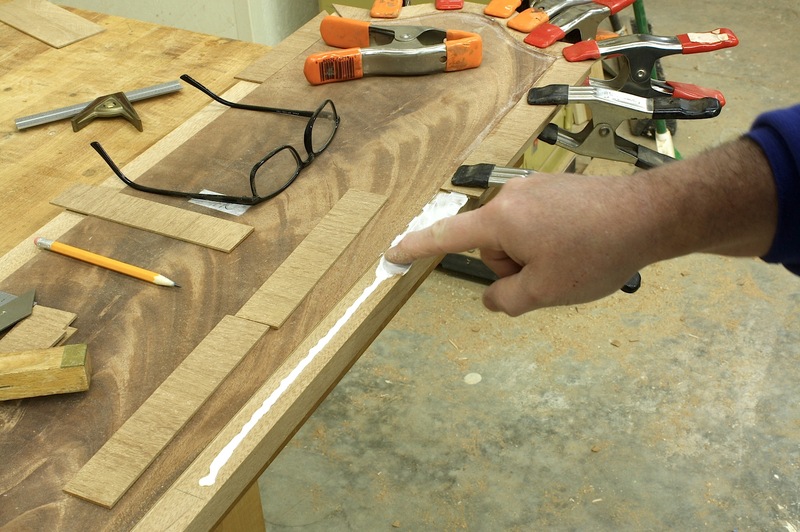 After the top-edge pieces are fit and the corners are trimmed, it’s time to glue the edge banding to the door. I contemplated hide glue for this, but my glue pot was not hot and any hide glue I had was outdated or moldy. Not going to use it. I did have yellow glue, but I also had a bottle of Titebond “No Run, No Drip” glue. A shorter set time was good, so I gave the glue a try. I was surprised at how easy this glue is to use and how quickly it sets. I am very happy with the results. If you need a shorter setup time when gluing, I would try this product. Remaining edges are covered with the pieces ripped at the saw. Straight runs are too easy. 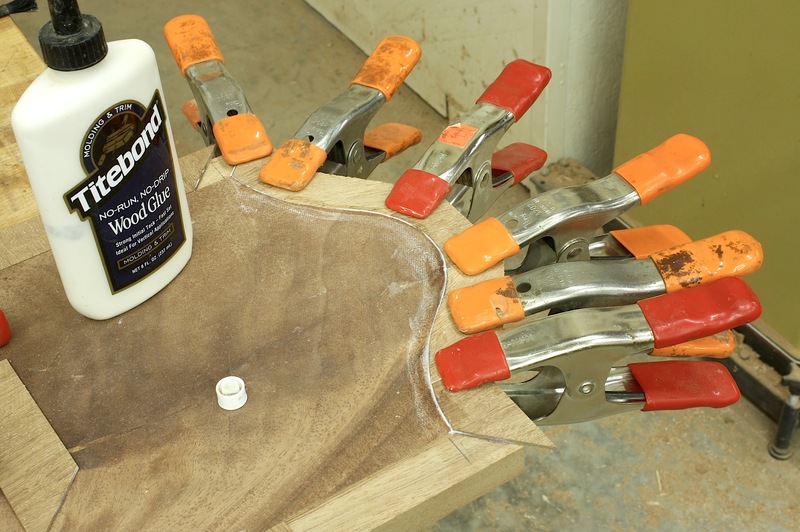 Smear glue along the edge, slip a piece in place then add clamps. The glue sets up fast enough that I easily transferred spring clamps along the way. If you do not have a large supply of spring clamps, use blue tape. It works, too. I see that since you can’t beat my acid brush with your toothbrush, you’ve resorted to using your finger to spread glue. 🙂 Can’t wait to find out how to do a miter and fix some banding. Keep it up. I am enjoying your class on edge banding. :<) It is good to see you back on staff at PW also.